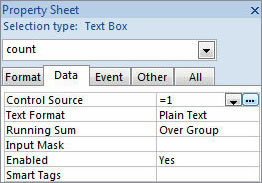 While using Microsoft Access 2007 reports sometimes it’s necessary to count how many records are contained in a report. 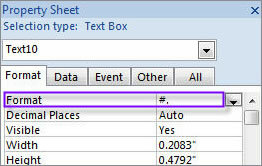 Access 2007 allows for that number to be displayed or let’s you add a line number to each record to make it easier to refer to a particular entry. There are two ways to add counts to a report, either by using the Layout View or the Design View. 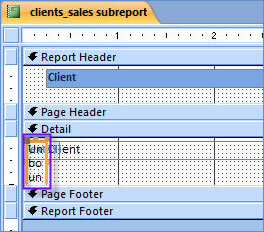 The quickest way to add counts to a report is by using the Layout View. When using the Layout View, Access 2007 builds an expression which counts all records that are not null. You can avoid this either by adding counts to fields which don’t allow nulls (like the ID field) or by manually changing the expression Access 2007 uses. In order to do that, go in the Property Sheet in the Data tab and in the Control Source property box, delete the expression and type =Count(*). You can number the items by using by using a calculated control and setting its Running Sum property. 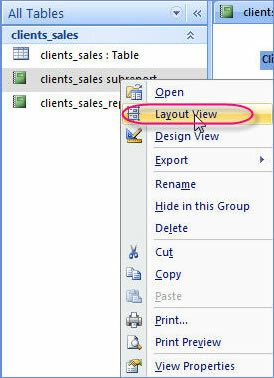 In the Navigation Pane, right click the report and choose the Design View. . In the Design ribbon, go to the Controls group and click Text Box. In the Details section of the report , drag the mouse to create the text box.